Cnidaria is a phylum of sea-dwelling animals that includes sea anemones, coral, jellyfish and hydra. Sea anemones and coral have a body shape known as a polyp, and are generally stationary, while jellyfish and hydra are medusae, and are able to move through the water. With these differences, it might come as no surprise that each species of cnidarian has different eating habits. Sea anemones are polyp-shaped, sedentary sea creatures that tend to resemble flowers. However, the "petals" on these underwater flowers are actually tentacles that contain stingers, and the "stalk" is basically one large stomach. Although they're unable to go hunting, sea anemones are no less predatory creatures that eat any plankton or small fish that are unlucky enough to swim too close to their tentacles and get stung. The tentacles push the small fish into the anemone's mouth, and after the unfortunate animal is digested, the waste exits the same way. Another type of polyp cnidarian is coral, which tend to be smaller and live together in colonies. Coral reefs are actually the skeletons of these cnidarians that have built up over time. Living coral are the only species of cnidarian who don't need to catch prey for food, because they get most of their nutrients from symbiotic algae living inside them called zooxanthellae. Probably the most commonly known type of cnidarian, and the species most likely to come into contact with humans, is the jellyfish. This medusa type is basically a free-floating stomach with stinging tentacles that hang down. The jellyfish floats through the water until it comes into contact with its prey, usually plankton or small fish. 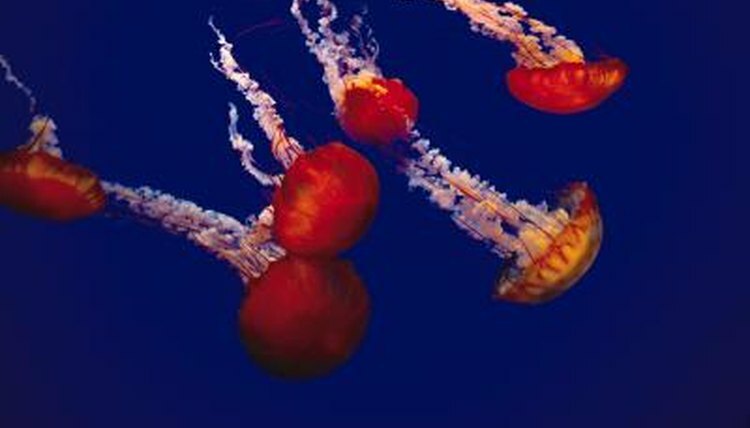 Individually, jellyfish don't eat very much; however, they sometimes travel in swarms large enough to deplete an area of food sources for other fish, which makes them a major threat to fish farms. Hydra are a type of tiny, freshwater cnidarian. Hydra are able to float through the water like a jellyfish, and can also propel themselves after prey by performing a cartwheel-like motion through the water. Although too small to eat most fish, hydra are able to catch and eat tiny organisms like brine shrimp and plankton.